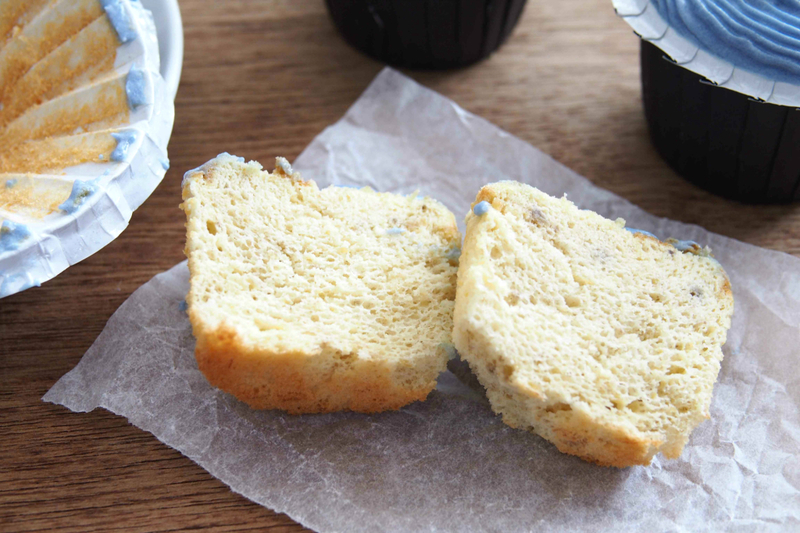 This is one of my favourite chiffon cake recipes. I baked these fluffy and soft banana chiffon cupcakes for my mother-in-law’s birthday. The original recipe was baked in tube pan. However, the tube pan shape would not have been appropriate for a birthday cake. So, I decided to make cupcakes instead. 1.In a bowl, using hand whisk, whisk egg yolks and sugar till sugar dissolves. Add oil and salt, whisk and add mashed bananas. Fold in sifted flour and mix well. Set aside. 2. Beat egg whites and cream of tartar with an electric mixer till soft peaks. Add in 40g sugar gradually and beat till stiff peaks. 3. Gently fold in 1/3 of the egg whites into the yolk mixture using a rubber spatula till incorporated. 4. Pour the mixture to the remaining egg whites and fold in gently till incorporated. 5. Preheat oven at 160°C fan forced/180°C regular. 6. Pour the batter into cupcake case and into muffin pan. 7. Bake for about 15 minutes or till skewer comes out clean. Remove pan from oven and allow cupcakes to cool in pan for about five minutes. 8. Remove cupcakes from pan and place them on a wire rack to cool completely. 9. While the cupcakes are cooling, in a large bowl, beat cream cheese, butter, powdered sugar, and vanilla extract until smooth. Colour the icing with purple food colouring. 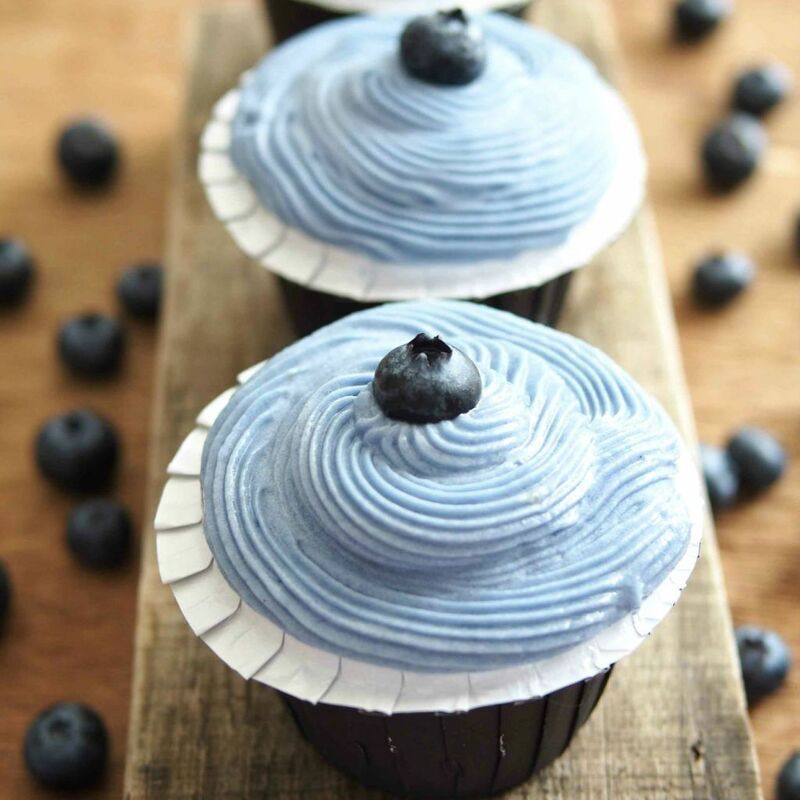 Frost cupcakes with piping tip of your choice and decorating with blueberries. I made the banana cupcakes with cream cheese frosting. They're delicious. The combination of a chiffon cake with cream cheese frosting is quite unusual, but it's quite nice. Thanks for the recipe. Thanks for dropping by and trying this recipe. 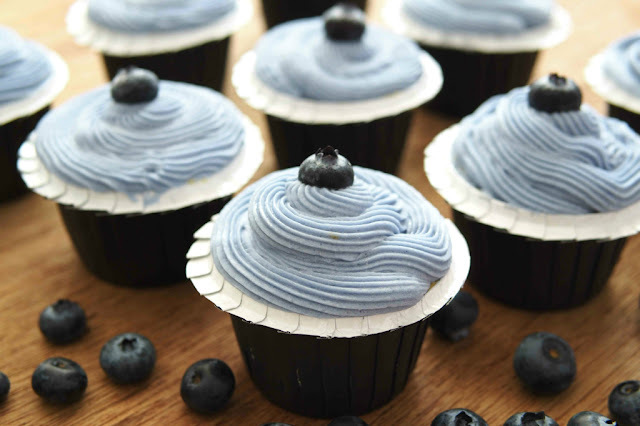 It is very nice to hear that you like this cup cake recipe.